HANG TIME PLAYOFF HEADQUARTERS — One of the greatest cities on the planet and one of the greatest fan bases in all of sports moved one step closer to reuniting today with the unveiling of the Golden State Warriors’ plans to move back to San Francisco and into a new arena by 2017, when the team can maneuver out of its lease at Oakland’s Oracle Arena. 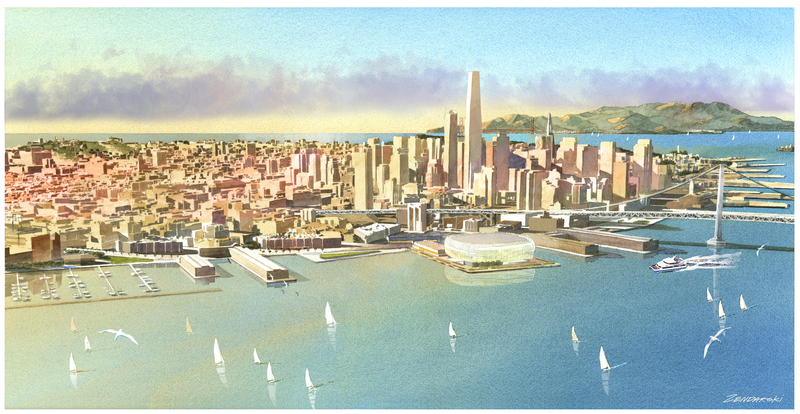 The new arena site is near the waterfront in downtown San Francisco on Piers 30-32 close to the San Francisco-Oakland Bay Bridge, a picturesque location that will provide some stunning views of the Bay Area. This is the latest effort by Warriors ownership, Joe Lacob and Peter Guber, to breathe new life into the franchise and give their fans hope for the future by diving back into their storied past. Some of the greatest success the Warriors have experienced came during their time in San Francisco. In the nine seasons they called San Francisco home, from 1962-63 to 1970-71, the Warriors had five winning seasons, made the playoffs five times and went to The Finals twice. This news didn’t shock the fervent fan base that has stuck with the team through the good and bad of the past 50 years, the last 41 in Oakland. When Lacob and Guber took over in 2010, they made it clear that they had plans to shake things up for an organization that has reached the playoffs just once since 1994, and that included a move back to the City by the Bay. Not only will the new arena be the Warriors’ new home, they’ll be using private funds to build and complete the $500 million project. And it will bring a state of the art facility to downtown San Francisco when almost every other professional sports team in the area resides outside of the city limits. Warriors executive and the NBA logo himself, Jerry West, made sure to mention that he’d seen new arenas built in Los Angeles, twice. There is an energy and excitement that’s associated with these sorts of projects, he said, one that attracts fans and also players that want to enjoy the latest and greatest facilities the game has to offer. If the final result looks anything like the artist renderings, there will be no need for a hard sell from any Warriors executives. The Warriors will have the most breathtaking venue in the league. And if Lacob and Guber have their way, they’ll also have a team to match up with that venue. Now im a die hard fan!!! They should just stay in oakland and change the name to oakland warriors. Oakland is a basketball mecca! Here are some examples jason kidd-world champ, leon powe-world champ, brian shaw-world champ, gary payton-world champ, bill russell 11frickin-time champ. Thats just to name a few but does neone see my point??? Might as well become a clippers fan j/k heeeyyy lobcity a kings fan tyreke and cousins. But never a lakers fan!!! Now im a die hard fan!!! They should just stay in oakland and change the name to oakland warriors. Oakland is a basketball mecca! Here are some examples jason kidd-world champ, leon powe-world champ, brian shaw-world champ, gary payton-world champ, bill russell 11frickin-time champ. Thats just to name a few but does neone see my point??? What has come out of frisco other than homosexuals???????????? Please neone???? Who really cares if some random guy in Florida doesn’t like what we call ourselves? What are they gonna do when the earthquake hits? that was a realy great move think about it san Fran needs mor teams in the city look at all the great fans they have fans from the city all over the west coast even in oakland oaktown fans will still come see them if they are true fans it is only like a 10 mile drive over the bay bridge ggreat move san Fransisco GO GIANTS!!!!!! San Francisco Warriors..We would look forward to that..hope by that time we’ll be seeing a better players and a better team. Goodluck! PEACE! I’m not hatin’ or anything on your team, but damn why Golden State??? Why not Oakland/San Francisco Warriors, or Bay Area Warriors, but GS you are reppin’ the whole state of California like the Angels did before they changed their name!!! And L,A. already has the Lakers and Clippers, and Sacramento has the Kings, so why do the Warriors go by Golden State???? I think your team needs a name change more than an arena change!!!!! Well MAYBE they will finally change the STUPID Golden State name to San Francisco Warriors!!! I have so many people ask me when my Orlando Magic play the Warriors where is Golden State??!!! So yeah you definitely need a change in city/state/whatever it is more than a new area/arena! GS has to be the lamest out there, that would be like calllin the Heat, or the Magic The Sunshine State Heat or Magic!! So, damn get a real city name, and stop worrying where they play as most people here on the east coast don’t know where the Warriors play anyways!!!!! Geeeze!!! ohhh The Golden State warriors can move from Oakland to San Francisco…but when the Sacramento Kings want to move from Sacramento to Anaheim…ALL THE RED TAPE COMES OUT. San Francisco is already to crowded and condensed. Not good to build a stadium closer to the fault line. Maybe that ugly Oakland plaza willl become a grievance/rehab center. yesssss im soo happy back to san fran BABY!!! not a big deal for me. i always take the BART anyways. still, San Francisco is San Francisco compared to Oakland. This is truly great news… easy BART and MUNI access, state of the art facility and a great b-ball team. Wow just wait till the peir collapses unded them. Warriors have one of the best fan bases the come out and support the team even when the team is bad. Pier 30-32? Where in the heck are we going to park? I hope a good portion of that money is going toward an adequate parking structure. @Mr. West’s comment about free agents: It’s not like any of the players reside in Oaktown anyway, they just won’t have to travel across the bay to play. noooo……..hell no….they send warrior all the way to San fransisco?? across the seas and oceans….noo……….now what am i gonna do??? Drive over the bridge and get to watch your team in a brand new arena, thats what! It’s not far, and it’s a hell of lot better location than the old building they are in now. Just be thankful they arent moving to Seattle or something ;). You are right Mack!! expecially for the city across USA that would like to have a NBA’s team!